A rustic yet elegant establishment featuring views of Lake Tahoe. 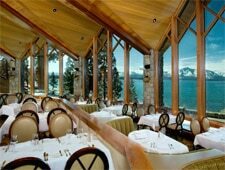 : Vaulted ceilings and cathedral-esque windows showcase lake views at this signature restaurant of the Edgewater Tahoe resort. The dining experience is given touches of elegance by the staff's proper service and amuse-bouches to perk up the palate. Chef Frank Stagnaro regularly changes the menu to present new creations that feature seasonal ingredients and seafood. Global influences also often appear in dishes, as in the appetizer of soy-braised Berkshire pork belly with stir-fried vegetables and saké broth. Reflecting the lodge-like surroundings are rustic main dishes such as the elk chop with sun-dried cherry relish, and salmon with Dungeness crab, lemon couscous and orange ginger salsa. Desserts might include bananas Foster or a goat cheese parfait with honey-roasted blueberries.